The print edition can be ordered from 1001 Publishers. Download the epub edition here. For the best reading experience we recommend e-book software Calibre, which is free to download here. 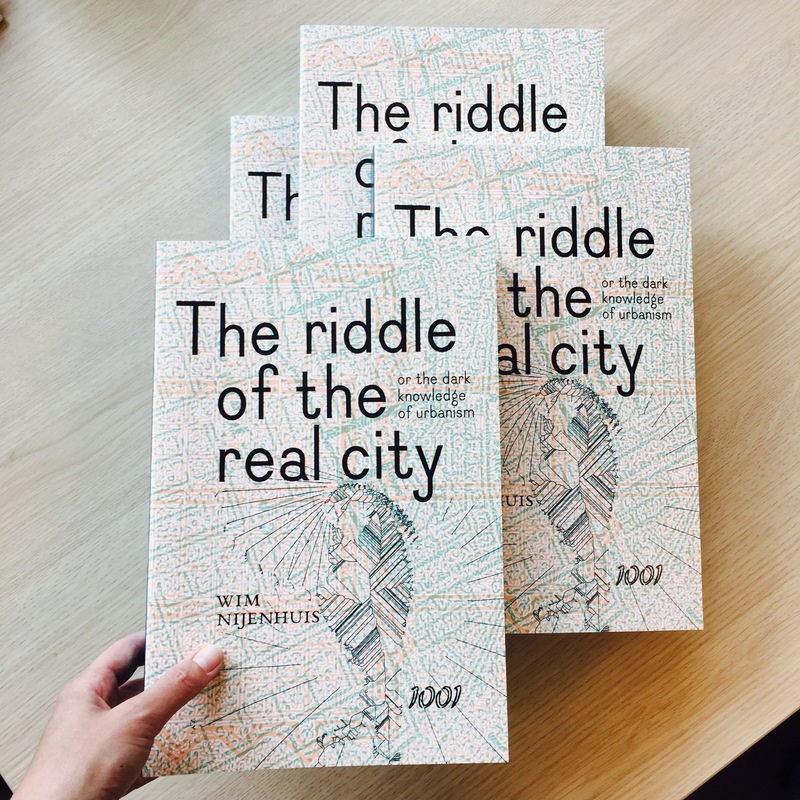 About the book: Does our knowledge about city and urban planning have solid ground? Can historical research promote creative thinking? How can we theorise about urban design and architecture in our age of the media? These questions have guided the creation of this multi-layered, richly documented and illustrated triptych, in which the Dutch architectural theorist Wim Nijenhuis pursues a creative goal: to stimulate new ways of thinking in architectural culture. I – a treatise on urban history. Using the archaeological-genealogical toolkit Nijenhuis reveals the difference between urbanistic discourse in the modern and the classical age; the first staging the street and public space, the latter adhering to representation and mathematical order. In great detail he shows how modern urbanism did not emerge from idealistic motives and technical urgencies, but from an accidental mix of medical, engineering and aesthetical parlances, and how classical thinking on the city dissociated from Renaissance by an intertwining of military science, political science, anthropology and ethics. II – a bundle of essays about the condition of the city in our media age. In strikingly composed texts the author prophesies how rapid traffic and transmission speed of media will distort the perception of our real cities. This gradual event will profoundly influence the cultural role of architecture. III – a set of meditations about epistemological problems. Questioning the practice of critical writing, Nijenhuis proposes change of subjectivity (and thereby worldview), ethical indifference, parody, curative mythomania and hypermodern dilettantism. The book is composed as a cloud essay that serves to enrich the reader’s theoretical understanding of urban interventions. Dialoguing with philosophers like Bataille, Deleuze, Foucault, Klossowski, Sloterdijk and Virilio, Nijenhuis covers multiple disciplines such as urbanism, architecture, history, media science, philosophy and art. Stretching urbanistic thinking beyond its limits he carries the reader along into the miraculous world of the street, the engineer, the norm, the form, order, fortresses, discipline, army camps, city frontiers, the Temple of Salomon, the quest for beauty, the ‘impressiveness’ of images, speed, the tragedy of the omnipolis, solidification of time, and the liquidising potency of apocalypticism and Taoist non-action. 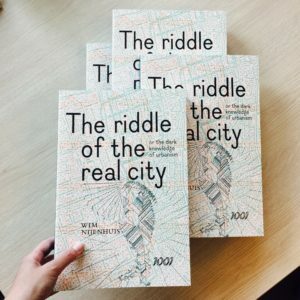 The Riddle of the Real City testifies to four experimental exercises: transitory subjectivism to reveal hidden dimensions of the person, transhistorical verticality to communicate with singular events from the past, theory as toolkit and pursuing a personal path in reading and investigation. 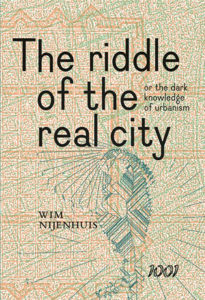 About the author: Wim Nijenhuis is Associate Professor Emeritus theory in art and independent writer. He studied urbanism at the Delft University of Technology and has a PhD in Architectural Theory and History. Among his many publications, he is the (co-)author of Eating Brazil (1999) and The Diabolical Highway (2007). Colophon: Author: Wim Nijenhuis. Translated from the Dutch by Laura Vroomen & Nina Woodson. Design & development: OSP (Gijs de Heij, Ludi Loiseau & Sarah Magnan). Publisher: Uitgeverij Duizend & Een / 1001 Publishers and Institute of Network Cultures. Amsterdam 2017. ISBN: 9789071346460 (print) / 9789071346477 (epub).